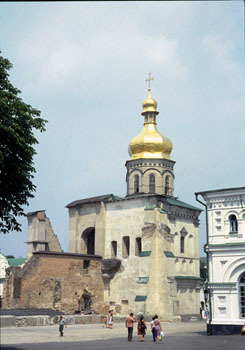 The Pechersk Lavra (Києво-Печерська лавра; Киево-Печерская лавра), the Monastery of the Caves, was allegedly founded in 1051 by Anthony and Theodosius. The monastery later became the center for the expansion and consolidation of Christianity in Kievan Rus', and one of the three main monasteries in imperial Russia (A "lavra" is an upgraded monastery.). The monastery complex has suffered much damage over the years (wars, fires, demolitions, lootings, revolutions, invasions, etc. ), and there has been a lot of re-building of the different structures; there is really only one church still surviving from the twelfth century. The caves, which were a central part of the monastery, in its earliest years, are still there, and you can easily get lost in them without a good guide. But there are an awful lot of skeletons/bones packed in there. In every nook and crevice, as I can recall, there were bones stuffed in there. I think that the guide was able to tell us who was buried in such and such a place, but only to a degree. The monastery also has some regularly-preserved bodies, which is what it takes to be considered a saint. The other thing that I recall is that you were not supposed to take photographs down in the caves, but, as evidence of the continuing triumph of the profit motive, I have now seen offered for sale on the web video tours of the monastery, including footage from the caves. It has always been difficult to study the history of early Kievan Rus'. Problem one is simply a lack of sources. There are not that many surviving documents from say, 500-1200, and for a long time there was not much archeological work being done in the field. There are many reasons for the lack of documents, including the back and forth nature of who controlled the area, the wars and invasions, natural disasters, etc. For example, much was destroyed in the repeated Mongol invasions and the lengthy periods of civil strife after the eleventh century. There are also not a lot of documents from Russia's neighbors. Remember that the Byzantine Empire came to an end in 1453, although there are some surviving Byzantine sources that shed some light on early Rus'. The Mongols (and before that the different peoples from Central Asia) left little in the way of surviving documentation. As for Poland/Lithuania, that commonwealth was not a treasure trove of accurate record-keeping. For Russia, there was little or no relationship to western Europe until much later in the Middle Ages. So, in reality, not much in terms of written sources survive. The other problem with the study of early Russian history has been what one might call ideological. On one level, was the creation of the first Kievan Rus' state a product of internal Russian developments? Or was it brought to Russia by the conquest of the Vikings or other mercenary marauders from Western Europe?. The answer to that question depended on how one interpreted fragmentary documents that we have, especially the Primary Chronicle. Look, does anyone in their right mind, think that a people would "invite" the Vikings to come and rule over them? It just does not make sense. Maybe the Russians later "invited" the Mongols too. The other aspect of the ideological problem of studying early Russian history involved the exact nature of "Russia" and "Ukraine" or "Kiev." Was this first state Russian or was it Ukrainian (or Kievan)? Does it make a difference which it was? Realistically, there are not that much in the way of ethnic, linguistic or religious differences between Ukrainians and Russians, and it is pretty clear that there was not much in the way of an organized society in northern or northwestern Russia at the time when Kiev emerged as an organized entity; and technically much of Ukraine did not become part of Russia until the seventeenth century. So one is left with the question of whether Kievan Rus' was Russian or Ukrainian. How a scholar, historian, or anyone for that matter, answers depends a lot on one's present political connections. 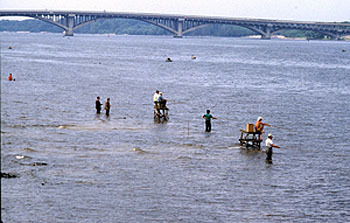 This is a photo of the eastern, or left bank, of the Dnieper River in Kiev. In most of Russia the western (or right) banks of rivers are hilly; while the east (or left) banks are low where most flooding occurs. Here the people are swimming and fishing in the river; you can see the "life guard" chairs. This was about four years after Chernobyl, which is upriver of Kiev. Kiev prospered at this location because of its ability to control the lucrative river trade route from the Baltic Sea in the north down the Dnieper River and then across the Black Sea to Constantinople. Raw goods moved south, and finished luxuries came back north. Ok, so you understand that it is really difficult to say with any degree of certainty the specifics of what happened in early Rus'. What we can say for sure is that an organized political state, centered on Kiev, emerged in the tenth century. Scholars for years remarked at how late that political formation happened in Russia as compared to Western Europe, but with the exception of the short-lived Carolingian empire from about 775 to 840, there was also not much existing in the way of effective state organization in Western or Eastern Europe from about 300 to 1000. 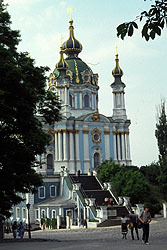 St. Andrew's Cathedral (Андріївська церква) was built in Kiev between 1747 and 1754 by order of Empress Elizabeth I. The church was located on a terrace of Starokyivskaya hill, on the main route from the upper city to the lower, and older, Podil district along the river. This spot was where tradition has it that the apostle St. Andrew erected a cross and prophesized the foundation of a great Christian city. Bartholomeo Rastrelli (1700-71), who was also responsible for the Winter Palace in St. Petersburg, designed this baroque structure. Construction was carried out under the supervision of Ivan Michurin. According to legend (www.odyssei.com/travel-tips/2259.html), "in times immemorial, there was the sea where the Dnipro River flows now. When St. Andrew came to Kiev and erected the cross on the hill where now St. Andrew's Church stands, the sea drained away. But a part of it remained and hid under the hill. When later the church was built there, a stream opened under the altar. That is why there are no bells at St. Andrew's Church, as with the first bell stroke water would awaken and flood not only Kyiv but the entire territory of the left bank of the Dnipro." The Kievan state lasting really only from about 950 to maybe 1100 began to decay quickly, especially in comparison to what was going on in western Europe in the eleventh century where an agricultural revolution was taking place that greatly increased productivity and boosted trade. Although, for example, both France and England continued to have problems of succession to the thrones of their countries, both countries managed to survive hereditary problems; not Russia. In Russia, the external issues included the serious pressures that came from tribes in Central Asia such as the Polovtsy (Polovetsians). Also the Russian ties to Byzantium suffered as a result of first the split between Eastern and Western churches (finalized in the eleventh century) and then the shift of trade routes away from Constantinople as a result of the Crusades and the 1204 sack of Constantinople. More important for Kiev were internal considerations. There were continued problems with succession to the throne of Grand Prince. Princely succession in theory was to move from elder to younger brother and then from uncle to nephew as well as from father to son. This made an almost unsolvable problem of who was to succeed whom to the throne. The result was almost continuous internecine war and then the splintering of the unity of the state into regional components. This was also a problem throughout Europe at the time, and most of those areas survived intact in one way or another. Russia would probably have been okay too and eventually managed to put everything back together again if it had not been for the appearance of the Mongols who clearly put an end to the Russian experiment. The final remnants of Kievan Rus' were destroyed by the Mongol invasions of 1237-1240. Some lectures by the late Professor Michael Boro Petrovich are available on the web: Viking Invasions, Riurik, Fall of Kievan Rus'. Alan Kimball, University of Oregon, "Two Women, Olga and Anna, and the Christianization of Rus’"
Khazaria.com has much information about the early Khazars (650-1016), the only society to convert as a whole to Judaism.